La posa del mosaico in inox si fa in due tappe In seguito ogni piastrella (inox ceramica) è fissata alla sua trama di nylon per facilitarvi la posa del mosaico in inox. Composizione mosaico in inox. Ogni piastrella di mosaico in vetro e pietra è incollata con un adesivo potente su una trama di nylon per formare una grande placca che faciliterà la posa del mosaico in vetro e pietra. La miscela di vetro e pietra su una placca di mosaico porterà un risultato visivo molto estetico. Ogni piastrella di mosaico in vetro è incollata con un adesivo potente su una trama di nylon per formare una grande placca che faciliterà la posa del mosaico in vetro. I nostri prodotti possono anche essere utilizzati negli esterni. Il mosaico in madreperla è fabbricato a partire da materie naturali. Ogni piastrella è unica : cio’ darà originalità alla vostra creazione. Composizione mosaico in madreperla In seguito ogni piastrella (madreperla ceramica) è fissato su una trama di nylon. In seguito ogni piastrella (madreperla ceramica) è fissato su una trama di nylon. Il mosaico in madreperla è fabbricato a partire da materie naturali. Ogni piastrella è unica : cio’ darà originalità alla vostra creazione. Spessore del Mosaico : 6 mm. Il mosaico è - adatto per il muro. - Se la superficie interessata é ad alto tasso di umiditá, in tal caso usare. eliminare colla superflua dai giunti. - Per ottenere un ottimale effetto di omogeneitá di colore. Ogni piastrella di mosaico inpasta di vetro è incollata con un adesivo potente su una trama di nylon per formare una grande placca che faciliterà la posa del mosaico in pasta di vetro. bellissimo mosaico di vetro per un bagno, doccia o piscina. Ogni piastrella di mosaico in pasta di vetro è incollata con un adesivo potente su una trama di nylon per formare una grande placca che faciliterà la posa del mosaico in pasta di vetro. Composizione mosaico in pasta di vetro. Description :: Stunning purple iridescent vitreous glass mosaic tiles :: Suitable for bathroom and kitchen walls - ideal for splashbacks, borders and feature walls :: 4mm thick :: This listing is for 1 sheet :: 1 sheet is 33cm x 33cm :: 10 sheets = 1.07 square metre. 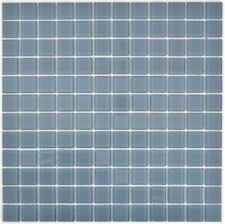 --- Sheets of blue & white mix glass mosaic tiles --- MINIMUM ORDER OF 3 SHEETS REQUIRED --- Suitable for bathroom and kitchen walls --- Perfect for bathrooms, showers, borders, splashbacks and feature walls --- 4mm in thickness --- 1 sheet of tiles is 30cm x 30cm and is the unit of measure for this listing --- 11 sheets = 1 square metre --- This listing is for buying 1SQM which is 11, 30cm x 30cm sheet ---. Glass Mosaic Wall Tiles 1 SQUARE METER Materials: Glass Colour: Textured Lava Black Suitable for bathroom and kitchen walls and ideal for making splashbacks, borders and feature walls The mosaics tile pieces are glued onto a flexible backing making them easy to lay These mosaic tiles can be bought as a small sample in a seperate listing in our shop Measurements: 1 sheet is 30cm x 30cm 11 sheets make up one square meter and is the unit of measure for this listing Tile pieces are approx: 22mm x 58mm brick shape tiles Tile thickness is 8mm This listing is for buying 30cm x 30cm sheets ---Renovation Renovating DIY Interior Design Designer Modern Hong Kong Foil Glass Tiles Ideal Home Improvement Build Building Restoration Bathroom Shower Basin Bath Toilet Wet Room Kitchen Utility Room Restaurant Cafe Coffee Shop Decorating Decoration. Description :: Stunning iridescent white vitreous glass mosaic tiles :: Suitable for bathroom and kitchen walls - ideal for splashbacks, borders and feature walls :: 4mm thick :: This listing is for 1 sheet :: 1 sheet is 33cm x 33cm :: 10 sheets = 1.07 square metre. --- Sheets of ice white glass mosaic wall tiles --- Suitable for bathroom and kitchen walls --- Perfect for borders, splashbacks, showers, bathrooms and feature walls --- 4mm in thickness --- 1 sheet of tiles is 30cm x 30cm and is the unit of measure for this listing --- 11 sheets = 1 square metre --- This listing is for buying 1 x 30cm x 30cm sheet ---. Description :: White and black glossy hexagonal ceramic mosaic wall tiles :: 1 SQUARE METER :: Stunning modern designer look :: Suitable for bathroom and kitchen walls - ideal for splashbacks, borders and feature walls :: 5mm thick :: 1 sheet is 20cm x 30cm :: 13 sheets equal 1 square meter which is the unit of measure for this listing :: Bathroom Wall Tiles Mesh Backing Shower Basin Bath Toilet Splashback Feature Wall Walls ::DIY Home Decorating Decoration Interior Design Designing Designer Project Renovation Renovating Building About Us Ebays Best Place to Buy taps, sinks, mosaic tiles and door canopies. 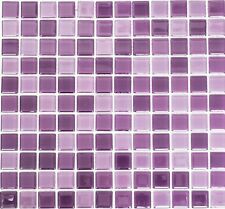 Description :: Stunning purple iridescent vitreous glass mosaic tiles 1 SQUARE METRE :: Suitable for bathroom and kitchen walls - ideal for splashbacks, borders and feature walls :: 4mm thick :: This listing is for 1 square metre :: 1 sheet is 33cm x 33cm :: 10 sheets = 1.07 square metre. TILE DESCRIPTION · Tile colour: Black Glitter. · Tile Material: Glass. · This listing is for a square meter which is 11 tile sheets. · Full tile sheet measures 300x300x4mm (single sheet available in a separate listing) · 11 full tile sheets make up 1 SQM. (available in a separate listing) · Individual tile pieces measure 23x23mm, 48x48mm · Suitable for kitchen and bathroom walls. · Ideal for making splash backs, borders and feature walls. · Tile pieces are glued onto a flexible backing making them easy to lay. Visit our ebay store for many more quality products!. Glass Mosaic Wall Tiles 1 SQUARE METER Materials: Glass Colour: Textured Purple Suitable for bathroom and kitchen walls and ideal for making splashbacks, borders and feature walls The mosaics tile pieces are glued onto a flexible backing making them easy to lay These mosaic tiles can be bought as a small sample in a seperate listing in our shop Measurements: 1 sheet is 30cm x 30cm 11 sheets make up one square meter and is the unit of measure for this listing Tile pieces are approx: 22mm x 58mm brick shape tiles Tile thickness is 8mm This listing is for buying 11 X 30cm x 30cm sheets ---Renovation Renovating DIY Interior Design Designer Modern Hong Kong Foil Glass Tiles Ideal Home Improvement Build Building Restoration Bathroom Shower Basin Bath Toilet Wet Room Kitchen Utility Room Restaurant Cafe Coffee Shop Decorating Decoration. Description :: Stunning iridescent white vitreous glass mosaic tiles 1 SQUARE METRE :: Suitable for bathroom and kitchen walls - ideal for splashbacks, borders and feature walls :: 4mm thick :: This listing is for 1 square metre :: 1 sheet is 33cm x 33cm :: 10 sheets = 1.07 square metre. 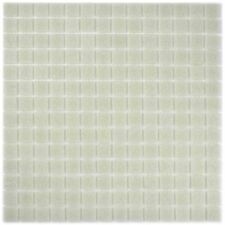 Description :: Bright white glass mosaic wall tiles :: 1 SQUARE METER :: Suitable for bathroom and kitchen walls - ideal for splashbacks, borders and feature walls :: 4mm thick :: 1 sheet is 30cm x 30cm :: 11 sheets = 1 square metre which is the unit of measure for this listing. Glass Mosaic Wall Tiles. Colour: Blue, green and white aqua mix. Ideal for splashbacks, borders, tile edges and feature walls, wetrooms, showers etc and not limited to the bathroom and kitchen. --- Glass Mosaic Wall Tiles --- 1 SQUARE METER --- Materials: Glass --- Colour: Black, silver and white with multicolour glitter --- Suitable for bathroom and kitchen walls and ideal for making splashbacks, borders and feature walls --- These mosaic tiles can be bought as a small sample in a seperate listing in our shop --- Measurements: ------ 1 sheet is 30cm x 30cm ------ 11 sheets make up one square meter and is the unit of measure for this listing ------ Each sheet contains 108 tile pieces ------ Tile pieces are: 15mm x 48mm brick shape tiles ------ Tile thickness is 4mm ------ This listing is for buying 11 X 30cm x 30cm sheets --- The mosaics tile pieces are glued onto a flexible backing making them easy to lay. --- Sheets of Blue & Aqua mix glass mosaic tiles --- MINIMUM ORDER OF 3 SHEETS REQUIRED --- Suitable for bathroom and kitchen walls --- Perfect for bathrooms, showers, borders, splashbacks and feature walls --- 4mm in thickness --- 1 sheet of tiles is 30cm x 30cm and is the unit of measure for this listing --- 11 sheets = 1 square metre --- This listing is for buying 1SQM which is 11, 30cm x 30xm sheets ---. Glass Mosaic Wall Tiles 1 SQUARE METER Materials: Glass Colour: Liquid Silver Lava Suitable for bathroom and kitchen walls and ideal for making splashbacks, borders and feature walls The mosaics tile pieces are glued onto a flexible backing making them easy to lay These mosaic tiles can be bought as a small sample in a seperate listing in our shop Measurements: 1 sheet is 30cm x 30cm 11 sheets make up one square meter and is the unit of measure for this listing Tile pieces are approx: 22mm x 58mm brick shape tiles Tile thickness is 8mm This listing is for buying 30cm x 30cm sheets ---Renovation Renovating DIY Interior Design Designer Modern Hong Kong Foil Glass Tiles Ideal Home Improvement Build Building Restoration Bathroom Shower Basin Bath Toilet Wet Room Kitchen Utility Room Restaurant Cafe Coffee Shop Decorating Decoration. --- Silver Glitter Glass Mosaic Wall Tiles --- 1 SQUARE METER --- Materials: Glass --- Colour: Silver with glitter --- Suitable for bathroom and kitchen walls and ideal for making splashbacks, borders and feature walls --- The mosaics tile pieces are glued onto a flexible backing making them easy to lay --- These mosaic tiles can be bought as a small sample in a seperate listing in our shop --- --- Measurements: ------ 1 sheet is 30cm x 30cm ------ 11 sheets make up one square meter and is the unit of measure for this listing ------ Each sheet contains 144 tile pieces ------ Tile pieces are: 23mm x 23mm ------ Tile thickness is 4mm ------ This listing is for buying 11 X 30cm x 30cm sheets ------ DIY Home Decor Decorating Decoration Renovation Project Interior Design Designer Feature Wall Border Strip Bathroom Shower Basin Toilet. --- Glass Miror Mix Mosaic Wall Tiles --- 1 SQUARE METER --- Material: Glass --- Colour: Silver mirror foil mix --- Suitable for bathroom and kitchen walls and ideal for making splashbacks, borders and feature walls --- Measurements: ------ 1 sheet is 30.4cm x 30.4cm ------ 11 sheets make up 1. TILE DESCRIPTION · Tile colour: Black Glitter. · Tile Material: Glass. · This listing is for a square meter which is 11 tile sheets. · Full tile sheet measures 300x300x4mm (single sheet available in a separate listing) · 11 full tile sheets make up 1 SQM. (available in a separate listing) · Individual tile pieces measure 15x48mm · Suitable for kitchen and bathroom walls. · Ideal for making splash backs, borders and feature walls. · Tile pieces are glued onto a flexible backing making them easy to lay. Visit our ebay store for many more quality products!. Glass Mosaic Wall Tiles. Tile thickness is 4mm. Suitable for bathroom and kitchen walls and ideal for making splashbacks, borders and feature walls. 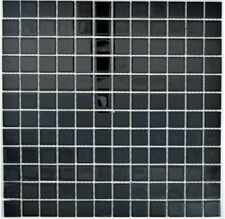 Item description: Mosaic Tiles 1 SQUARE METRE Materials: Glass Texture: Textured Glass Colour: Silver Suitable for bathroom and kitchen walls and ideal for making splashbacks, borders and feature walls Measurements: 1 sheet is 30cm x 30cm 11 sheets make up one square metre and is the unit of measure for this listing Tile thickness is 8mm This listing is for buying 11 x 30cm x 30cm sheets Please see our shop for a massive selection of mosaic tiles to buy online at highly competetive prices About Grand Taps And Tiles: The best shop on Ebay to buy taps, sinks, showers and mosaic tiles. We are also property developers and are aware cheap fittings can actually de-value your home, our products are fantastic quality designed to increase the value of your home, our products are fitted to our own developments. --- Iradescent White Mix Lusterous Glass Mosaic Wall Tiles --- 1 SQUARE METER --- Suitable for bathroom and kitchen walls --- Perfect for borders, splashbacks and feature walls --- 8mm in thickness --- 1 sheet of tiles is approx 30cm x 30cm --- Each individual tile piece is 15mm x 15mm --- 11 sheets = 1 square metre which is the unit of measure for this listing --- --- Bathroom Wall Tiles Mesh Backing Shower Basin Bath Toilet Splashback Feature Wall Walls --- DIY Home Decorating Decoration Interior Design Designing Designer Project Renovation Renovating Building.